A Little Princess opens with seven-year-old Sara Crewe and her father, Captain Crewe, arriving at Miss Minchin's boarding school for girls in London. Captain Crewe is very wealthy and states that Sara is a destined for a lavish, comfortable future. Despite being pampered all her life in India, Sara herself is very intelligent, polite, and creative. Headmistress Miss Minchin is secretly jealous and dislikes Sara for her cleverness, but openly praises and flatters her because of her father's wealth. Before departing for India, Captain Crewe purchases Sara an elegant wardrobe and a doll whom Sara adores and names "Emily." Sara's friendliness and love for pretending and storytelling makes her popular with most of the school's students. They soon begin regarding her as a princess, which she embraces. Sara befriends Ermengarde, the school dunce; Lottie, a spoiled four-year-old student; and Becky, the scullery maid. A few years later, Sara receives word from Captain Crewe that he and a childhood friend have become partners in a scheme to gain control of a diamond mine which could potentially multiply his wealth enormously. Miss Minchin later treats Sara to a very luxurious eleventh birthday party per Captain Crewe's request. Captain Crewe's lawyer arrives unexpectedly and tells Miss Minchin that Captain Crewe has died of jungle fever and his partner has gone missing. He then adds that business troubles that rendered him completely poor, leaving Sara an orphaned beggar. Enraged that she will never be reimbursed for all the services and goods spent on Sara since receiving the last check, Miss Minchin seizes all of Sara's possessions except for an outgrown black frock and Emily. Miss Minchin then tells Sara that she will live in the attic next to Becky and work as a servant in order to continue living in the school. For the next several years Sara is made to teach the younger students and run errands in all weathers; she is starved and abused by Miss Minchin, the cook, and the other servants. She is consoled by Ermengarde, Lottie, and Becky, who visit her during the night, as well as Emily and a rat she names Melchisedec. Sara extensively uses her imagination as a means of coping, pretending that she and Becky are prisoners in the Bastille. Sara also continues pretending she is still a princess, and continues to be kind and polite to everyone, including her offenders. One day Sara finds a fourpence in the street and uses it to buy six buns from a friendly baker. The baker witnesses Sara give five of the buns to a beggar girl before leaving. 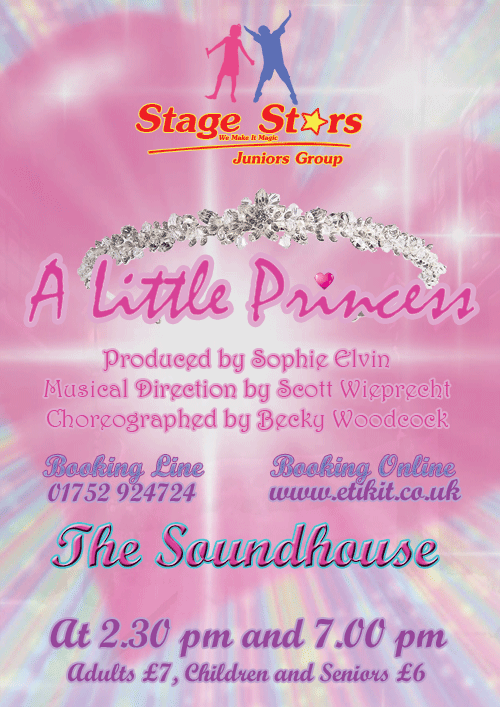 The baker regards Sara as a princess and invites the beggar girl to live with her. Meanwhile, a man from India, Tom Carrisford, moves into the house next door. Sara becomes interested and sympathetic when she learns about Mr. Carrisford, who is sickly. It is revealed that Mr. Carrisford was Captain Crewe's childhood friend and partner. During their time in India, they had both caught high fevers, and in his delirium, Mr. Carrisford abandoned Captain Crewe. However, the diamond mine scheme had not fallen through as they both had initially believed, and Carrisford became extraordinarily wealthy. Mr. Carrisford feels extremely guilty that Captain Crewe's daughter is missing because of the ordeal and seeks to find her. Her name and school are unknown to him, following leads in Paris and Moscow. Sara meets Ram Dass, Mr. Carrisford's servant, when his pet monkey escapes into her room through her skylight. Ram Dass immediately admires Sara when she speaks to him in Hindustani. Ram Dass climbs across the roof into Sara's room to retrieve the monkey and sees the poor condition of her room. Ram Dass tells Mr. Carrisford of Sara, who becomes interested in her. Mr. Carrisford decides to secretly send food and gifts to Sara and Becky. Sara is very thankful but does not know who her "mysterious friend" is. The following days become less burdensome to Sara and Becky, to Miss Minchin's confusion. One night, the monkey escapes into Sara's room through the skylight; Sara decides to return the monkey to Mr. Carrisford the next morning. Sara mentions she had lived in India to Mr. Carrisford, who then subsequently learns that Sara is the missing daughter of Captain Crewe. Sara learns that Mr. Carrisford was her father's friend and forgives him when she realizes that he is the mysterious friend who helped her. When Miss Minchin visits to reclaim Sara, she is informed that Sara will be living with Mr. Carrisford and her entire fortune has been restored. Miss Minchin kindly asks Sara to come back and continue being a student at her school, but Sara rejects her offer. Becky is invited to live with and be the personal attendant of Sara. With her newfound wealth Sara makes a deal with the baker, proposing to cover the bills for food given to any hungry child. Sara thus proves her worth as a true "princess."